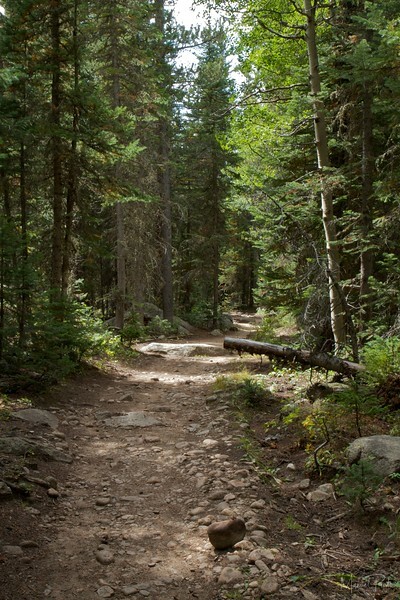 The trail is quickly absorbed by a tall, crowded forest filled by aspen, hanging mosses, thick ground vegetation, and large boulders. The creek is generally accessible throughout (audible when not immediately visible), with many eddies and nooks suitable for fishing or a private respite. Conditions, scenery and difficulty vary little over the first 1.5 miles; in 1.75 miles the trail climbs more assertively to Timberline Falls (2.2 miles : 9,223'), a deep, staged gorge capped by immense boulders accessible from the trail. The falls' energetic chutes can be surveyed from above, or more intimately from two steep social trails - fore and aft - leading down to them.